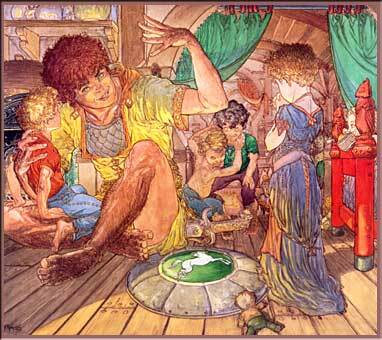 "The children are: on Merry's knee is little Frodo, in the foreground, Elanor. Behind Merry are little Pippin and Merry. Peeking over the bedstead is Goldilocks. He is telling them the story of Éowyn and the Witch-King of Angmar."